I've been home quite a few days already and finally have some time for my last post about Tucson. Friday was our last day and we only had a couple of hours for fun. 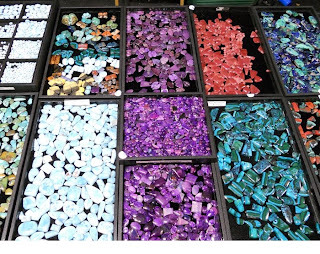 We went to the Tucson Gem & Mineral show and saw some gorgeous gem and mineral specimens. Here are some pictures of the wonderful things you can see. I also made the acquaintance of a fellow San Diegan who has gorgeous cabachons for sale. I already busted my cab budget but I did get his name and number so I can give him a call once my budget recovers. I hope you enjoyed a peek into our Tucson adventures. Be sure to keep an eye on my blog to see some of the designs I make with the gorgeous beads and stones I picked up. Day 5 - are we done yet? We started out the day (Thursday) eating another breakfast at the Waffle House on E. Irvington. This is where we had the BEST service in all the restaurants we ate at in Tucson. In fact I think Waffle House should give lessons on proper restaurant customer service to quite a few other places in this town. I don't know if all Waffle House restaurants are this inviting - but I hope so! When you walk in all the staff sings out a hearty "Good Morning"! They do this for everyone who walks in. They sit you as quickly as possible (but when the place is full you may have to wait a bit for a table). They quickly bring you coffee or juice or whatever you want. Your breakfast is made to order and if you need something cooked a bit more they happily take it back. I know this because I like my scrambled eggs cooked well done and dry, bacon and hashbrowns cooked well done and crispy and they err on the side of not quite as well done as I like. But they took it back and cooked it some more until it was perfect. I absolutely enjoyed my breakfast all 3 times we ate there. And their cinnamon raisin bread is great! It is loaded with cinnamon - just the way I like it. Some folks call them "Awful House" or a greasy spoon - but I expect some grease (or oil) when I'm eating bacon and hashbrowns and I hate greasy food but thought my breakfast was delicious. My eggs weren't at all greasy. They also didn't put a pound of butter on the toast - just a light swipe with more on the table if that wasn't enough. So - I highly recommend the Waffle House on E. Irvington for a hearty, welcoming breakfast. They are open 24 hours so you can try them anytime. I didn't try a waffle - but they have maple syrup which gives them another plus in my book! Here's a picture of the morning staff and the front of the restaurant. Our next stop was Electric Park. This place ended up being a blast. They had boxes and bins of rough, polished chunks, petrified wood, tools and I don't know what else. There aren't a ton of high grade gems here - but one of my favorite gemstone dealers, Royal Quality Gems, was here and I had to pay him a visit. I also met one of my online friends, Robyn Hawk. She has a running blog about Tucson, Tucson Gem Show - Live!, every year and it is always interesting. And, since my mom grew up in Barstow, we had to stop and say hi to Diamond Pacific Tools. 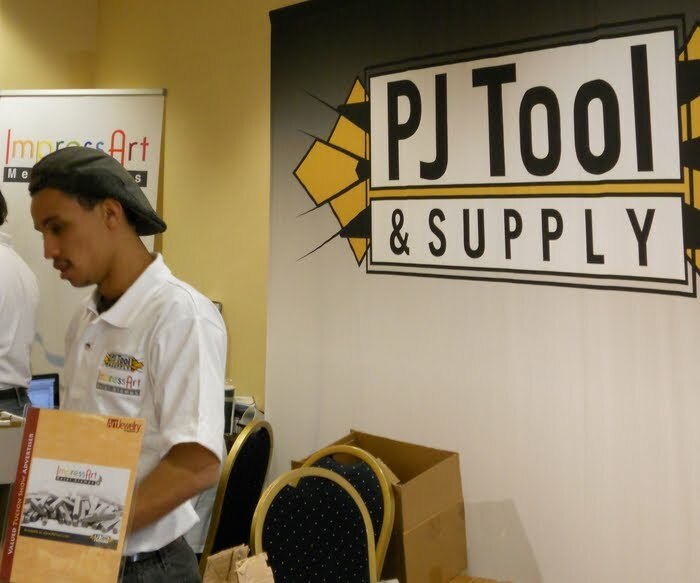 They have some awesome looking tools - tumblers, grinders and polishers, grinding and polishing wheels and lots more. And, small town that Barstow is, Don Depue (technical director) knew some of my mom's cousins who live in Barstow. Here's a picture of Robyn and I and one of Don and my mom with some tools in the background, of course! We next wanted around the pavilion and found a company that uses pressure to inject gold, silver and copper into quartz. This creates some beautiful stones! The company is Gold in Quartz. I absolutely loved the cabs they had for sale and my mom had to buy the cutest seahorse! I'll get a picture of it to share with you next time I visit her. I should have saved some cabachon budget for this show! But I have their card so I can give them a call once I have some sales from all the beauties I bought in Tucson this week. Here's a picture of Onnik Arakelian and his wife at the show. We wandered through all the outdoor tents and I made a stop at Peru Minerals where I got some pyrite cubes and hearts (including a broken heart!) and some rhodocrosite hearts. They had many carved animals, hearts in many sizes and stones, tumbled rocks and lots more. We wandered around more, talked to some vendors, saw a LOT of beautiful polished and unpolished stones and generally enjoyed ourself. We went back into the pavilion to say goodbye to Robyn and the one booth she kept trying to visit was finally open. This was Miland Tools and, darn her, she got me hooked on more tools. Miland Seuss is the tool maker. He will gladly demonstrate any tool you want to see. I bought a texture hammer (rain pattern) and cuff making plier today (synclastic). Both Miland and his son are so very gracious and helpful and love to talk! After Electric Park we went in search of food. The food situation in the southern part of Tucson is really pitiful if you don't like a lot of fast food. 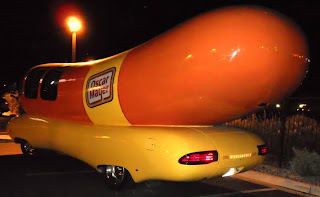 We hoped that if we drove toward downtown we might find something that looked good. We both like taquitos so we stopped at The Taco Shop Co. It doesn't look like much on the outside but the taquitos were fresh cooked, the guacamole was good, the lettuce and tomatoes were fresh and they had Dr. Pepper to drink. We spent a total of $7.50 on a not too filling, but still tasty lunch for two. You can't beat that! Our next stop was back to Holidome. I had a list of places to see and did a pretty good job of sticking to it. Our first stop was Opex Opals. I bought some gorgoues 5x7 cabs. I also found out the 2mm beads I looked at earlier were actually synthetic so I passed on those. We then headed into the big tent in search of some center drilled keshi and apatite rondelles for some gem friends. I didn't find the pearl place initially so we cruised by booths as we looked for BV Gems. My mom slowed down at a place with hair jewelry and I found BV Gems and started shopping. I picked out the apatite rondelles and then started looking at other beauties. I snagged bags of rubies, tourmaline and amethyst rondelles from the $10 sale box. I also picked up 2 strands of pink topaz long beads - beautiful! Here's a picture of Sunil and his wife and some of the beautiful gems I bought. Our final stop was Ta Pearls. Another gem friend had already picked through the center drilled keshi so by the time I got there most of the good strands were gone. I still dug through and was able to get a nice looking strand of white and bronze center drilled. And that was it for the day. We ended our day early and went back to the hotel to rest a bit. I thought I would do a quick stop at the Tucson Gem and Mineral Show - but I just didn't have the energy. After several hours of just vegging we drove north for dinner at California Pizza Kitchen (good food, so-so service) and called it a day. Day 4 - and we go some more! I may actually catch up on my posts today. Here are our adventures from yesterday. We started out at GL&W at the Grant Inn. This venue has an interesting mix of sellers. Outside you could buy inexpensive beads, shells, purses and wood carvings among other things. Inside the wholesale pavilions you could buy the normal variety of precious and semi-precious stones and beads in addition to jewelry, gems and minerals from Aghanistan, Africa, Pakistan, India and many other locals. We wandered among all the booths and were drawn to one selling fossils from many locales including Morocco. We live in Morocco for 2 years so we struck up a conversation with Joe Aaronson at Pangaea Industries, Inc. It turns out we lived in Morocco before he was even born! Now does that make me old?? LOL! We did buy some fossil coasters and pendants that were both found in Morocco since they really do look cool and who doesn't want to have a 350 million year old ammonite hanging around ones neck? Here's a picture of Joe and of some of the cool fossils we got from him. We made a short stop in the 2nd pavilion and bought some cabs - malachite/azurite for me and bloodstone for my mom since it was one of my Grandpa's favorite stones. Then we headed out to meet some of my mom's old work friends at the Old Pueblo Grill. We had a wonderful lunch. Good food, wonderful company and great service. It was a nice change from our dinner the night before! Here is a picture of our wonderful and patient server. After lunch we went back to GL&W at the Grant Inn. I found Kalpataru at this location (they often have something different at each venue), got some really neat sterling and gemmie beads and then we headed down to Globex at the Days Inn and the Pueblo Gem and Mineral show at the Riverpark Inn so I could look for some cabs for some friends. We first wandered through Globex and it reminded me of a middle eastern bazaar. There were folks selling barrels, buckets and boxes of rough stone along with polished cabs and strands of gemstones. We saw scarves, leather shoes, interesting hats, carved statues from wood and stone, giant slabs of stone with gorgeous pictures from the stone patterns - all for sale. And there were gyros, arizona fry bread, lamb kabobs, kettle corn and much more available for eating. It was pretty amazing! And that ends our adventures from yesterday. We started out the morning at JOGS since that was the last day for the show. My first goal was Sunwest Silver since they had good prices on bezels and decent prices on charms. Their selection of charms is HUGE!!! However, just as we went in the door we noticed a mad rush to buy things at the first booth area. Well - we just had to see what all the fuss was about. So we started checking out the various tables ($10/strand table, $8/strand table, ...). My mom wants an multi-strand necklace inspired by one she saw at River Park but hers is going to be really eclectic based on the "ingredients" she has purchased for it thus far. So as she was digging for beads for her necklace I was looking for good buys. I found a few, she found some strands she wanted, we paid and continued into the depths of the show. The next distractions were EARRINGS!!! My mom loves southwest style jewelry and is quickly sucked in when she sees turquoise! Needless to say there are MANY jewelry vendors and most have turquoise. This time she found some beautiful inlay jewelry (and yes EARRINGS!) at Select Lines. She was tempted to buy several pair - but we decided to wait until I heard back from a colleague to see if she wanted any for her stored. So we went on to Sunwest Silver (finally!). There I got bezels and charms and my mom found more EARRINGS! She did manage to resist temptation so we left with only my sterling findings in hand. Aren't they a cute couple! We then wandered around just to see what else drew our eye. Not surprising turquoise pulled us both in next. Turquoise Jewelry Mfg., Inc had gorgeous turquoise from Kingman, Narcozai, Bisbee and many other famous mines. All was guaranteed that it wasn't colored and it was all gorgeous. We wandered here, there through the show and then I had to do a quick run through SII Findings. I've purchased a few things from them and yesterday I found a great price on 2mm round, seamless, sterling beads. I snagged those along with some interesting bails. And then - LUNCH! We had a quick bite at the one of the little food tents outside the Gem Mall tents. After that we went into the other Gem Mall tent where I visited my favorite sterling seller Kalpataru who always has some of the best prices and interesting beads. We wandered around for a bit and then headed for Holidome. We did a quick pass through Lucky Gems (on the suggestion of some fellow residents at our hotel) and then on to Holidome. We only had about 45 minutes there so I made sure I visited CGM Findings and Opex Opal. We got some gorgeous boulder opal there in years past - but they were very picked over by the time we got there this year. However ... they have some GORGEOUS, FIREY opal strands and I may have to go back and get some of the 2mm beads. Even in that small size they are full of flash and fire. We did a quick walk through the big tent and I did visit Tripps to see their settings since I contemplate buying from them regularly. They didn't bring sterling settings with them, but I did buy a prong setting tool. As we left the Holidome tent I was again amazed to see trays of precious gemstones sitting on tables. All the colors of the rainbow with so much sparkle and just laying out for the world to see and for anyone to run their fingers through! 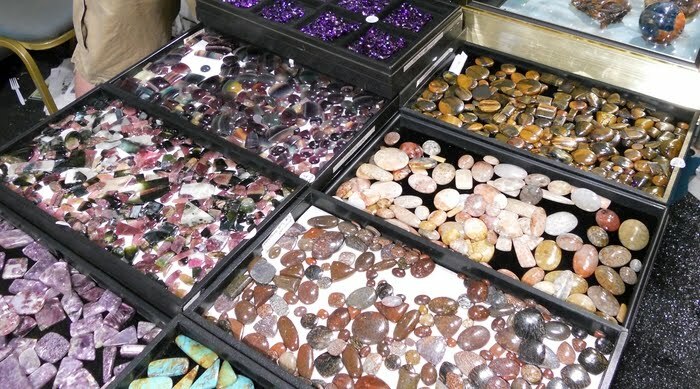 A moment at the Tucson gem show can be just breathtaking! Since I've been quite verbose tonight I'll do a quick recap of dinner. If you have a lot of time to burn then eat at the Javalina Cantina. The food is good but the service is not. I did like the saguaro glass they used for the margaritas and my mom did enjoy it! And here I am posing with the glass and a picture of the beautiful food presentation! And that's it for now. I'll tell you all about todays happenings tomorrow! And I just had to share a picture of the very vibrant bumble bee jasper. A beautiful yellow and black! Next we headed just down a few booths to Larimar Conlight. Jens and Cynthia are the owners but Cynthia is the sales person. She is absolutely wonderful to work with, is clearly proud of what she designs and sells and has wonderful things in all price ranges. I was looking for larimar since it is a beautiful stone and sells well in San Diego. I had an idea of what was "good" and what wasn't but wanted to check with her just to make sure my ideas were right. 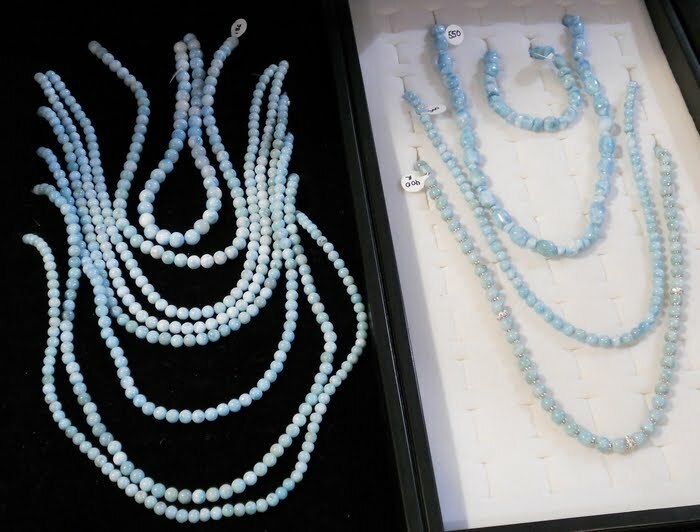 Fortunately - for those of us who just can't afford the price point of absolutely round beads, she had some nice faceted, not-quite-so-round beads, nice cabs in a range of prices and quality and some loosed beads which allowed me to get some different shapes without buying an entire strand. Here is a picture of Cynthia and my mom. Aren't they both lovely ladies! 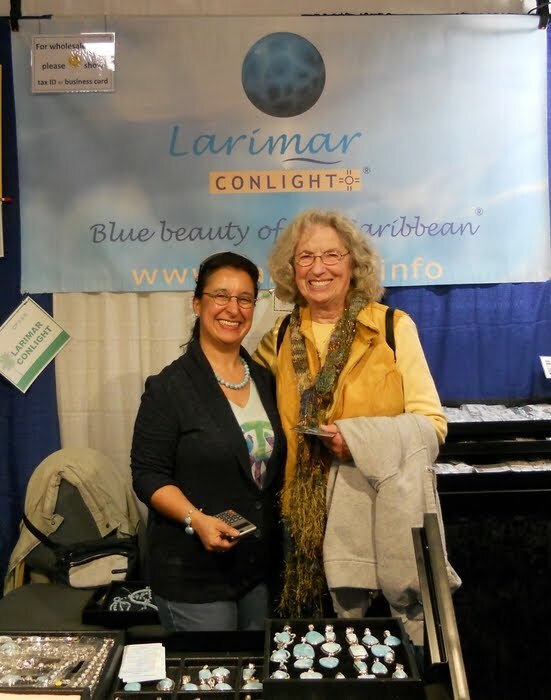 And here are some of the lovely larimar necklaces and pendants available at Larimar Conlight. 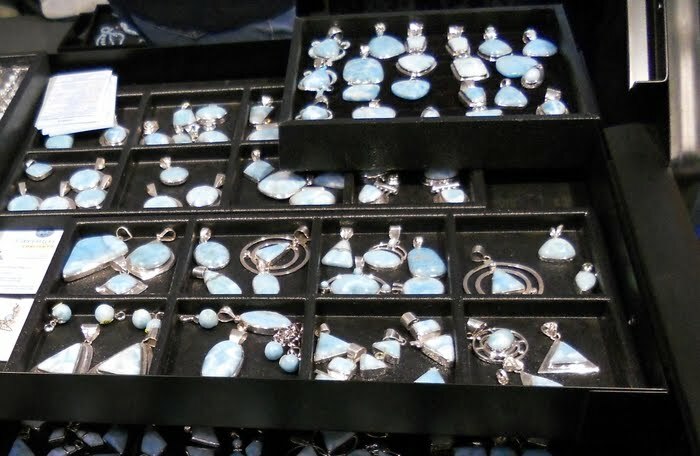 After I did my picking and choosing of larimar we wandered through the show to see other vendors I thought might be interesting. I wasn't doing well at choosing vendors from the book description, but during the wander to find them I did find some other interesting vendors - including one where I got some nice diamond files and diamond tipped drill bits. Then we had lunch there at the show where they were barbecuing hamburgers/hot dogs/veggie burgers fresh on the BBQ. I do love a fresh BBQ'd hamburger and these were good. Our next stop was at the Tucson Bead Show where I hoped to reconnect with one of my favorite lampworkers, Colleen Girard. I just LOVE her twisty beads!I wasn't sure I would find her there since the website for the show and her website disagreed on whether she would be there. Alas! Colleen was not there, but the visit wasn't a total waste. On our way to look for Colleen we walked by PJ Tool Supply. I couldn't think of any tool I just had to have, but my mom wanted to check out the metal stamps. I'm so glad she did because we found the funnest stamps for sale there. I'm not going to tell you what they are since I'm going to use them for some future designs. But they are unique as far as I know. I did get a picture of all the helpful young men (am I dating myself by calling them young? LOL!) 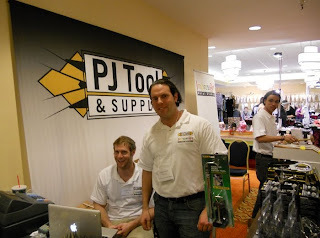 working hard to answer questions, help customers out, run a cash register (this was their first show with a cash register so they didn't know all the ins/outs of it yet), dig out inventory, ... As I was waiting for them to total everything up I did find a tool I had to have - a small brass caliper. Magic Mountain let me use theirs to measure beads/cabs and it was just so handy. I have a larger digital one at home - but this one I can leave in my gemshow bag (along with my loupe) and no batteries are required. Here are all those helpful guys! I checked out the clasps by Star Clasps to see if I liked them, totally forgot to stop by Ezel findings (drats! ), my mom found the gal who does beautiful beadwork. A few years back my mom bought one of her gorgeous, mega-beaded bracelets at the Pasadena Too Bead True Blue show. Next we were off to JOGS! I specifically went to JOGS to find You and Me Findings since I hit them up for sterling beads and things at just about every show I go to. I looked them up in the JOGS show pamphlet and couldn't find them. I asked about them up front and fortunately one of the JOGS people knew where they were located in the building and led us there. Apparently they changed their name ... to Merico Corp. Unfortunately they were already packed up!! What was up with that??? The show still had another day to go. Not only were they almost completely packed up - the guy doing the packing had no idea if they were showing anywhere else. I was not happy and made sure I sent them an email about this when I got home. I haven't heard back from them yet - who knows if I will. And that was it for day 2 in Tucson. Well we did have a very nice dinner at the Metropolitan Grill. Good food, nice atmosphere and the only issue was a very pleasant server who was in a hurry to leave - even if we weren't done talking to her yet. A little odd (she rushed off, after asking for our orders, before my mom gave her order ... kind of strange since what would she have served my mom if she didn't take her order? ), but in every other way the service was great. I'm here! Yay! I already did some fun shopping too! My mom is with me for another great Tucson gem show adventure. I'm sure I'll wear her down with all the venues I plan on visiting. We landed this afternoon and by the time we got our luggage, car and checked in at our hotel it was 5PM. I checked the show listings earlier and found that the Pueblo Gem and Mineral show at the Riverpark Inn was open until 7PM. It is also a show recommended by a fellow gem-aholic Robyn Hawk. She talked about it in her blog Tucson Gem Show - Live!. I just love reading about her daily experiences in Tucson. She showed pictures of some cabs at Magic Mountain gemstones so I had to go there. They have some gorgeous cabs! I have a tray set aside so I can finish looking tomorrow morning. Can you imagine they actually wanted to close up at 7PM tonight? LOL! I also visited several of the opal vendors, including Hopkins Opals where we bought some gorgeous cabachons and Opal My World. We also stopped by Opalcolors/Outback Sunstone Mining Co. where we bought some gorgeous Oregon sunstone briolettes. We picked out sets with a prominent reddish-orange spot in the center of the brio. They look nice against a white background, but the color really pops against your skin! Since everyone was closing up their booths we figured it must be time to leave and find some food. I actually planned ahead and did a google search for food places near this show. As I looked through various restaurants Caruso's popped up as a promising Italian restaurant. It had great reviews, has been around since the 1930's and seemed like a perfect spot to eat since I knew we wouldn't get lunch today and we would be hungry. I'm glad to say the reviews are spot on. We both had the only salad offered - Italian and it was perfect. For the main course I had the pasta special for the day and my mom got spaghetti. Both were delicious, as was the garlic bread they provide. We both love to eat the heels of bread and when we asked for just garlic bread heels our waiter gladly brought us some. The only thing they lack is a good selection of black teas. If you like the generic black teas (aka Lipton's, Farmer's) you'll be happy. However, if you like other types like Earl Grey or Darjeeling - bring your own tea. They will gladly provide you with hot water. Tomorrow I'll try to take pictures to share. Goodnight and have sweet, sparkly dreams! 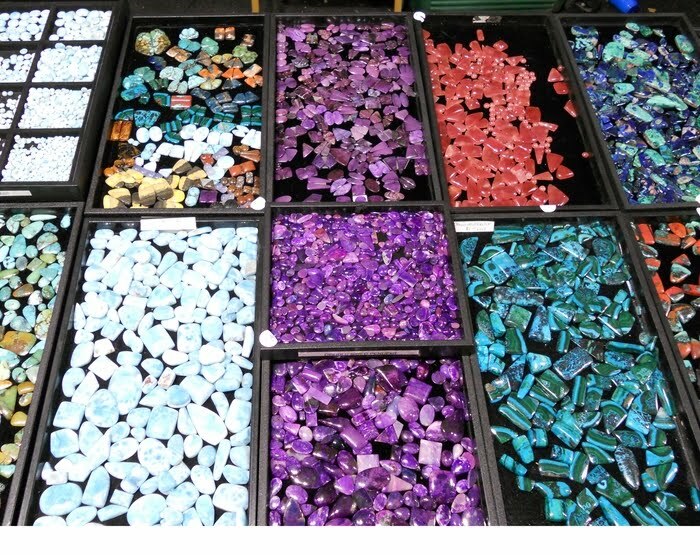 I'm so excited to be going to Tucson for the gem show again this year. I've got my venues mapped out and can't wait to see all the beauties over there!